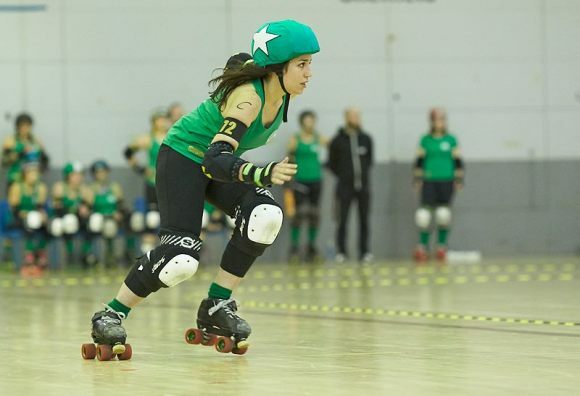 Last weekend saw a double-header at the Ponds Forge International Sports Centre where the Nottingham Roller Girls took-on the Sheffield Steel Roller Girls, while the Super Smash Brollers played The Inhuman League. Parking at the Sports Centre was packed! We had to park so high at the multi-storey car park we could see the whole of Sheffield; positive signs of an exciting event ahead! The rest of NRD had clearly done this before, choosing instead to take their own party bus. Indeed, there was a fantastic crowd at the centre and getting a seat was tough – more chairs were brought out, then even more. The commentators gave a brief rundown of the rules before the game started which helped to convince my friends I’d not just made them up. They really helped to keep the spectators involved in the game, especially during time-outs and official reviews. What was different from other games that I’d seen was the track was set up so the jam- line was closer to the crowd, rather than the far side. This helped us to see all the action from the start of the jam whistle: awesome! Here are some highlights of the games on the day..…. The girls were first on track , SSRG’s Cyndi Slaughter scoring the initial points with a fantastic apex jump. The play seemed super fast, the pack hardly standing still for an instance! NRG’s Lozferatu delivered a splendid display of blocking skills, holding off the SSRG jammer with the help of ‘assists’ from her teammates. 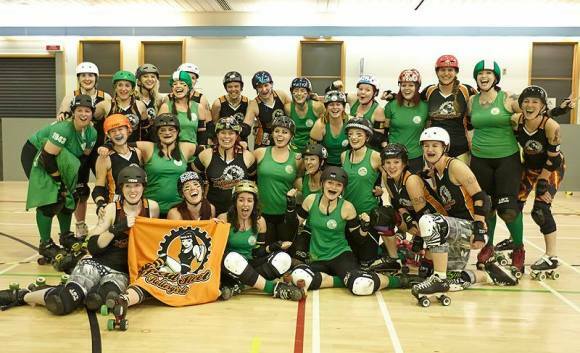 Despite some great play by the girls in green, SSRG were soon 30 points in the lead. NRG’s spirit wasn’t dampened, however, and the girls were soon full of energy – bouncing around to music during an official review. About 24 minutes in, Damndrea scored a mighty 15 points, reducing SSRG’s lead to 66-48. This inspired Hell ‘n’ Back to score another three points in the following jam, and the rest of the team followed suit playing a much more aggressive game. The guys and girls of Sheffield sure know how to put on a show and they had a great martial arts display from the local ‘Excel Martial Arts’ group led by Liam Richards, one half of the group ‘Strike’ who got to the semi-finals of Britain’s Got Talent. I think I heard right that one of the major influences for him starting martial arts was our very own Yan Dam! During the second half, every jam was accompanied by the thunder of skates echoing round the hall – the Super Smash Brollers audibly supporting their ‘Sisters’ from the balcony; broken up by T-Rex impressions as they channelled their inner dinosaurs to warm-up for their ensuing game. The drama soon ramped up again with a power jam to NRG. The score stood at 110 – 101 to the home team. This burst of action gave NRG’s number 11 the impetus to pull it back to 110 – 109 and the tension in the audience was immense! Sadly, it wasn’t to last and two of the NRG blockers were sent to the penalty box with only a minute remaining on the clock. The score remained at 123 – 109 as NRG called a time-out. In the ensuing jam, AK47 and POP5 did a sterling job of blocking but sadly Damndrea couldn’t get through their solid defence to score. 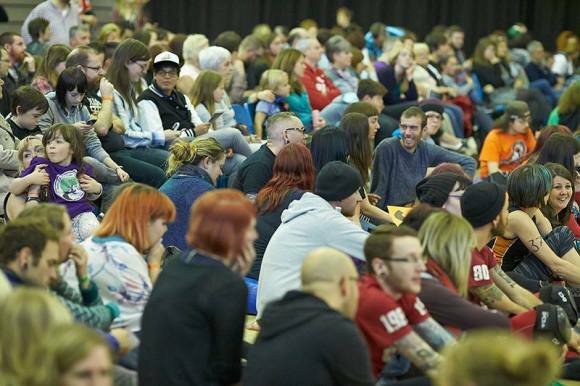 The crowd went wild for the final 20 seconds as the last jam went in SSRG’s favour. Cyndi Slaughter sailed through the NRG wall scoring 5 points, making the final score 128 – 109. It was a fantastic well-fought game, we hoped the lads would fight even harder! Within the first 30 seconds of the game, Skate Plissken and Bruce found themselves in the penalty box, shortly followed by Singletron whose awesome blocking may have been a little too awesome to avoid the ‘sin-bin’. The boys’ blocking skills were immense, working solidly together as a team, including an effective ‘fat controlling’ technique by Danimal, Bruce and Wreck-it Wragg. Langlois’ impressive skills on track seemed to inspire his opponents to block with great effect! 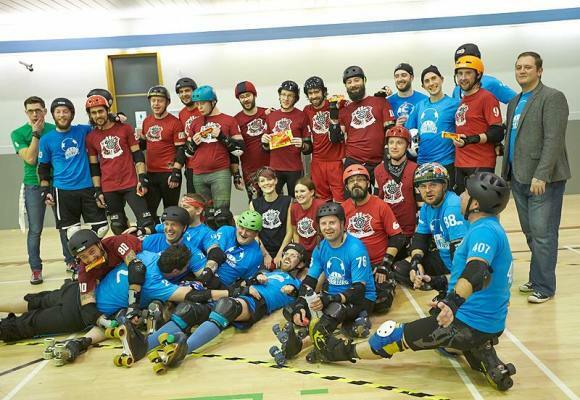 With aggressive hitting by both teams, Singletron took a nasty whack but was just able to skate to the St John’s Ambulance team who repaired his face just fine! The game was filled with some great runs including a 7 pointer from 1Up…. The second half began with a spectacular apex jump from TIL’s Thrilleas – the imposing chants of “In-hu-man” by the Sheffield audience was enough to dishearten any team but the Brollers kept battling with great determination – both Notts O’Gentle and Skate Plissken urging the crowd to cheer. Several NRG supporters notably roused the audience with friendly banter and louder chanting in response: Awesome job! Throughout the game SSB were penalty heavy, no doubt due to some pretty brutal blocking on the track. TIL’s superior skills meant they frequently gained lead jammer status, even though they were closely followed by SSB! 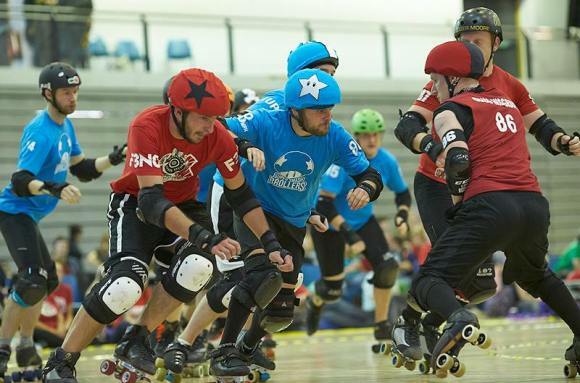 Both games were great fun to watch and all four teams demonstrated how sporting roller derby can be. Most importantly my friends enjoyed their first derby game and are really looking forward to the next!